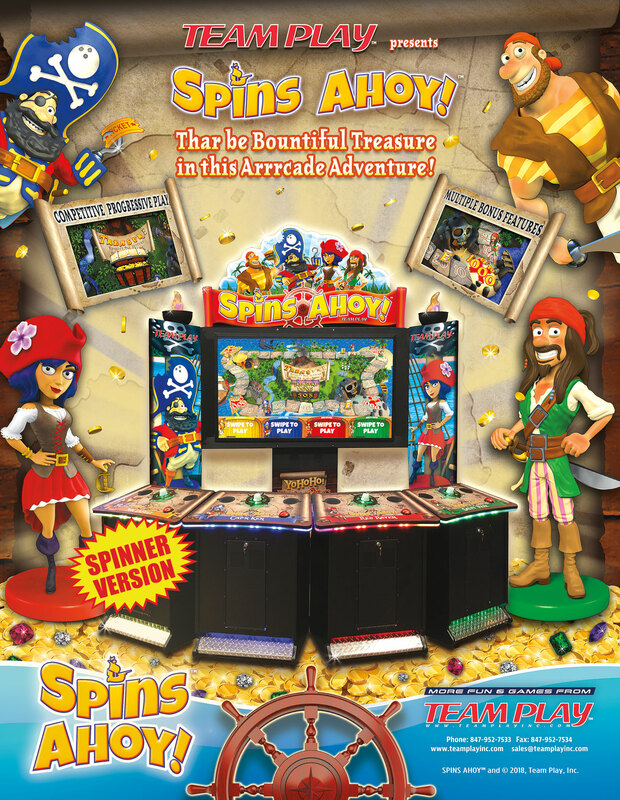 Spins Ahoy! is a new pirate-themed videmption game that we’ve mentioned on the site a couple of times now, starting back in the Spring when the game was spotted on test. Things have been quiet about it since on our end, but according to Team Play, the game has been enjoying strong (“phenomenal” was the word used) earnings that it has been experiencing while on these tests. Today, we can give you a deeper look at this new videmption title, which will also be the star of Team Play’s IAAPA 2018 booth next week (both versions). 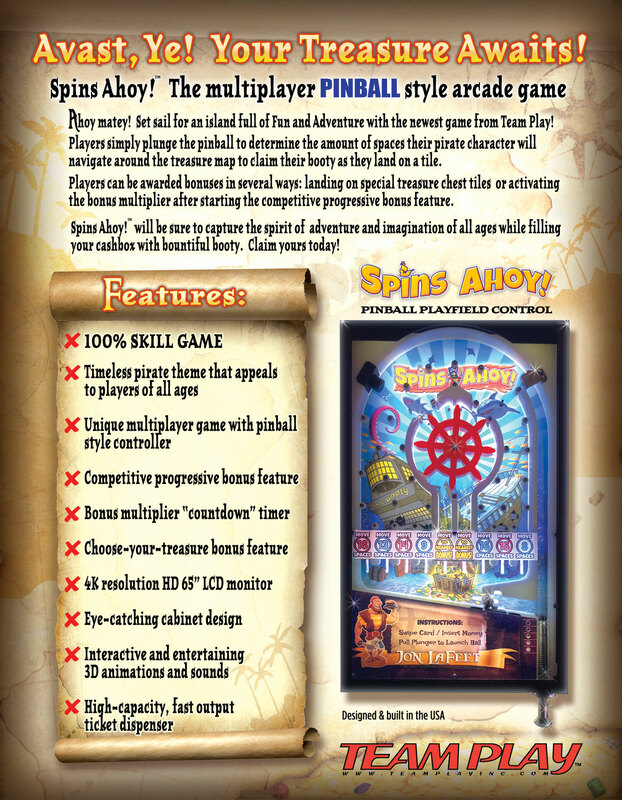 First, let’s start off with the info that there are two versions of this game – a Spinner version and a pinball version. We’ll get into the pinball version below this one. 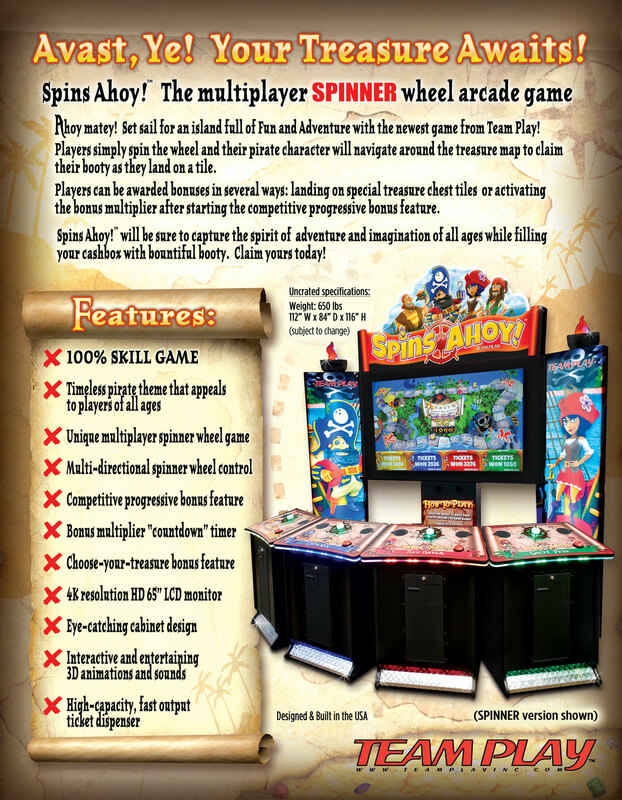 The spinner version is the original game design, that was initially tested at a Dave & Busters as Jumanji. This board game influence stuck with the game, although that is not entirely the influence at work here, given that Team Play released another pirate-themed board game in the past by the name of Pirate’s Booty Deluxe. One place that Spins Ahoy! stands out though is in the multiplayer offering; Pirate’s Booty was a single-player game, this offers up to four. This is also certainly a reason behind the strong earnings. The way to play is easy to learn – spin the wheel, watch your character move around the island board and where ever they stop, you win the tickets for that tile. The great thing about arcades that developers can take creative liberties when it comes to designing how a game is controlled. 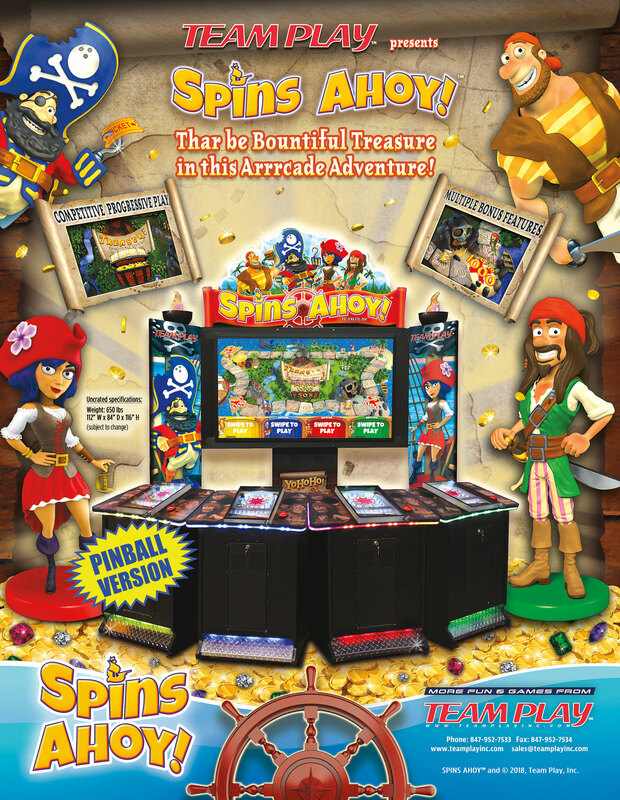 When I first heard that this game would have a “pinball version,” naturally I figured that meant a Spins Ahoy! themed pinball machine, but I was wrong about that. The controller of this model is a small pinball table in itself. As mentioned, both of these games will be found at the Team Play Inc. booth next week for IAAPA 2018. I’ll be there to capture video of the same and see how they work in person. What do you think about this new videmption game from what has been unveiled?